You are here: Home / Life Purpose / A veteran’s opinion — What’s worth dying for? Dying for the Mission, or Glory? World War II is the last time an enemy threatened to invade American territory. Since 1945, Americans have fought and died in Korea, Vietnam, Grenada, Panama, Bosnia, Iraq, Afghanistan, and many other places, in support of politically-directed, propaganda-driven, “national interest” conflicts. I was 20 years old when I arrived in Vietnam on December 4, 1971. I was a Cobra copilot/gunner, flying combat missions over Cambodia. 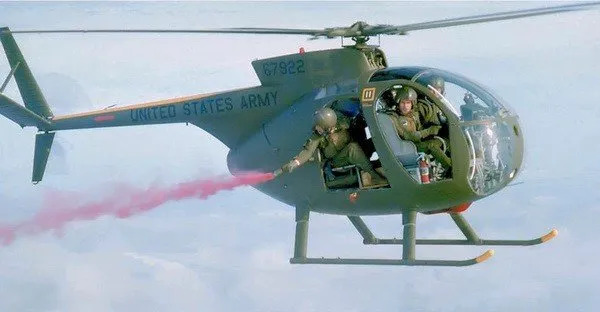 After two almost-catastrophic experiences due to in-flight mechanical failures during combat, I volunteered to fly light observation helicopters (LOH, or Loach), scouting enemy positions at low (treetop) level. People called them ‘bush-bait’ and their mission was known as ‘recon by sacrifice’. Loaches were famous for their crashworthiness. In early March, I was piloting a low-level scouting mission when my inexperienced back-seat gunner caused a tear gas grenade to explode in my cockpit, causing our loach to crash upside-down into a hillside. My two gunners survived and escaped with hardly a scratch. I was pinned against the ground, unconscious, with the chopper’s turbine engine still running erratically, in death throes; the stubby main rotor blade remnants throw continuous geysers of dirt into the air. When I didn’t respond to their shouts and tugs, they assumed I was dead. Expecting the dying loach to explode at any second, they ran away from the throbbing wreckage, leaving me in it. I awoke, dazed, sometime after they left. My face was lying against dirt and leaves. The wreckage vibrated as the rotors dug into the hillside. 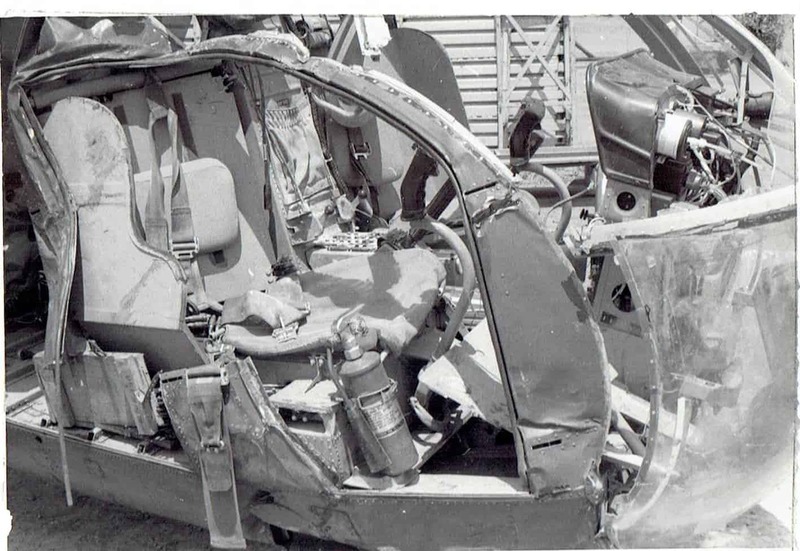 As you can see in the photo, my seat was twisted rearward, and I couldn’t unlatch my shoulder harness and seat belt. I was trapped. The bloodstains were from minor shrapnel cuts. 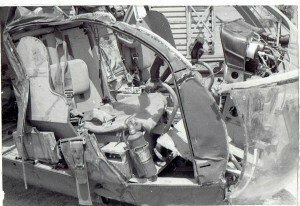 After repeatedly trying to unlatch my seat belt, I remember realizing that my death was imminent—if the tear gas didn’t kill me, the struggling turbine engine was sure to start a fire at any moment. I was tempted to lose hope and give up, but I kept trying. Blinded by the tear gas, and gasping desperately for air, I was finally able to free myself from the seat belt. 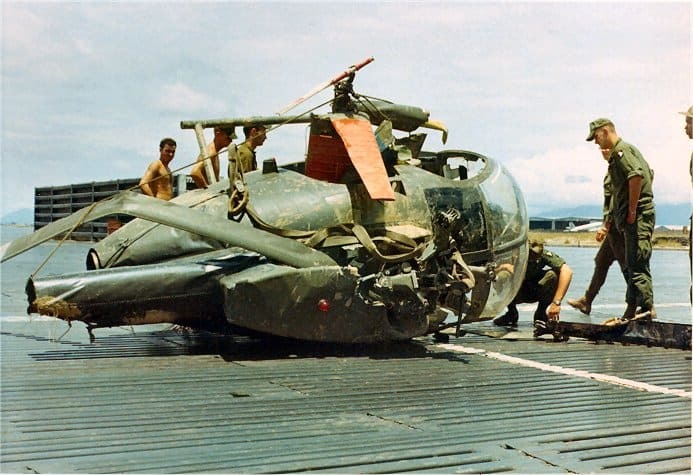 Then, still blinded and completely disoriented, I escaped through the missing front windscreen and crawled away from the noise, hoping not to get hit by the spinning rotor. As soon as I got away from the gas I started regaining my sight and my bearings. 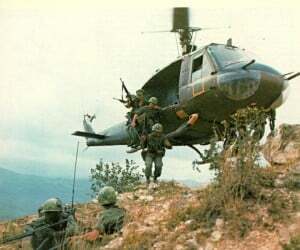 I gathered my crew, who were surprised to see me, and a Huey helicopter picked us up a few minutes later. They took us straight to the hospital, where we were treated and released. I spent the next few weeks recuperating from a concussion, a few stitches, and some very severe bruises before I was medically cleared to fly again. 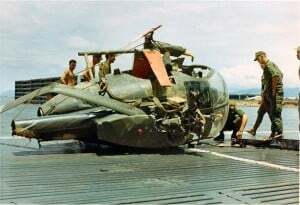 After crashing my loach in March ‘72, I was assigned to copilot duties in the Huey platoon. Although this was a demotion of responsibility, I welcomed it. Crashing my loach had shaken my confidence; I needed some time to get my ‘edge’ back. During the entire month of April ‘72, the North Vietnamese invaded South Vietnam with tanks and tens of thousands of troops. The last American infantry had already left Vietnam by 1972, so our South Vietnamese Army ground troop allies were forced to retreat, losing a lot of territory to the communists. Remember, times were much different in 1972 than now. 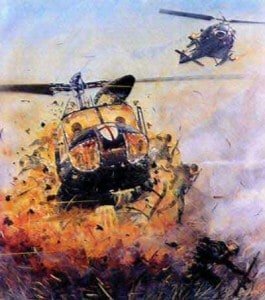 The rebellion and cynicism of that generation are exemplified in movies such as: “Born on the 4th of July, Easy Rider, Platoon, Full Metal Jacket, Rambo, The Deer Hunter, and Apocalypse Now. In the US, soldiers were taunted as ‘baby killers’ and spit at when they walked through airports. As a result, few wanted to wear their uniform in public, and some soldiers even bought wigs to conceal their military haircut. Politicians in Washington and Hanoi were in ‘peace talks’ so that America could disengage itself totally from Southeast Asia. Nixon called it “Peace with honor.” Nixon had already withdrawn all American ground troops, leaving aviation units to keep the pressure on Hanoi until Kissinger could negotiate our complete exit from Vietnam and the return of our POWs. On May 2, 1972 my flight school classmate Dan Miller and I were flying a Huey on a routine resupply mission when we heard a frantic emergency radio call from Air Force F-4 jet fighter crew, saying they’d been hit by a missile and were ejecting near the coastline—just a few miles East from our position. 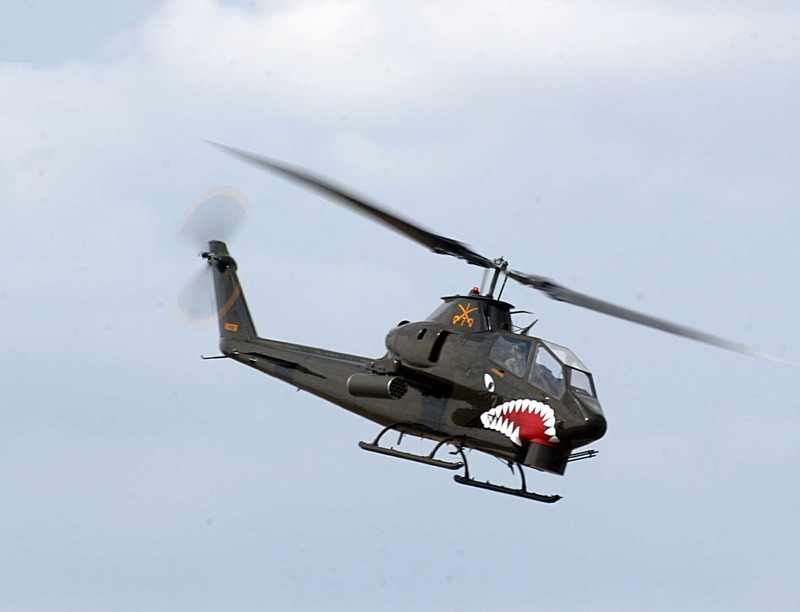 We immediately turned our Huey to rescue them, but then we heard another classmate, John Joseph “JJ” Petrilla, who was copiloting another Huey. JJ said he had the chutes in sight, so we returned to our planned route, but continued to monitor the rescue on our radio. 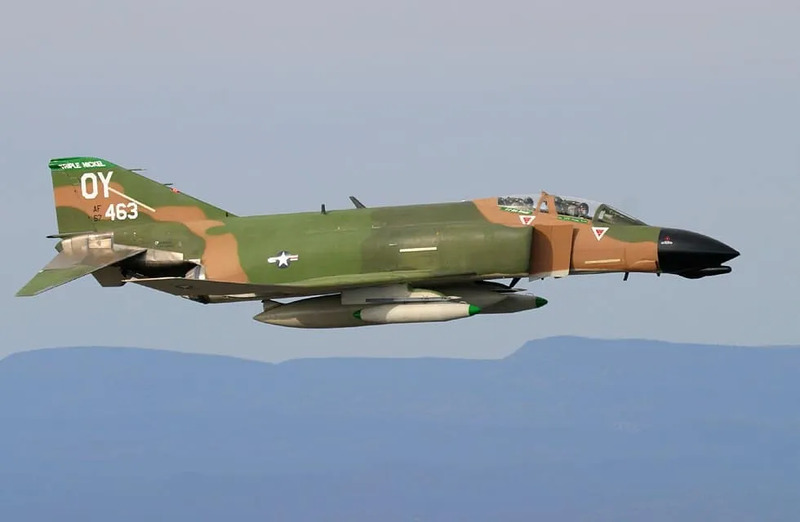 We heard JJ say they saw where the F-4 pilots’ chutes landed…then, that they’d picked them up…then, that they were ‘climbing out’ with the rescued pilots aboard. Then, one of our Cobra pilot’s shouted, “Break Right! Break Right! SAM! !” Then…stunned silence. 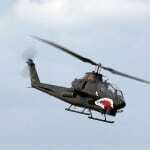 JJ’s Huey had been hit by a shoulder-fired, heat-seeking missile, exploding their Huey in mid-air at 700 feet. That night, back at our small island base, I felt like my life’s potential was being wasted for nothing, and I was sorry that I’d never live to see my grandchildren. I remember consciously and seriously considering shooting myself in the foot, in order to escape the war alive. But the risk of dying couldn’t overcome the certain shame of being a coward. So, What’s Worth Dying For? If I had died when I crashed my LOH, would my death have been worth it? What good would I have achieved? I’d say “None.” At the time, I was trying to find and kill ‘enemy’ human beings, whom I didn’t know or dislike, because some US government policy bureaucrats (had previously) wanted to make a point about stopping communist expansion in Southeast Asia. I emphasized “had previously” because by 1972 they knew their point wasn’t going to be made, but they were having trouble extricating themselves from the quagmire they’d created. In the meantime, good people were dying on both sides. So, dying ‘for the cause’ was meaningless. Or, do you think God would give me credit for patriotically supporting my country’s national interests at the expense of my fellow man? No, I don’t think so. When I stand before Almighty God at the final judgment, I would’ve been speechless. In contrast, JJ and his crew risked their lives to save others. Even though the dice rolled against them and they were killed, they died in the selfless act of trying to save strangers. You have only one life to give, and nobody knows when you’ll be called upon to risk your life, so I suggest you pre-decide what you’re willing to sacrifice your life for. Will you risk your life following orders to achieve the current ‘interests’ of incumbent politicians? Isn’t that what Hitler’s henchmen did? Wasn’t “I was just following orders” their excuse? The realization that I could no longer support “national interest” as justification for the government’s use of military force caused me to exit my military career. Every nation’s propaganda machine paints a patriotic picture, waves the flag, and calls its troops heroes, but the Bible says all earthly nations will be destroyed because of their evil practices when the Messiah returns. There are no moral nations on the earth; all are corrupt in varying degrees. Will you risk your life to save others? I suggest that this is the only valid reason to risk your physical life. Policemen and firemen (and everyone else) should risk themselves only to preserve life; not to preserve or protect property. No property is worth your life. Soldiers should only risk their lives (or use force against others) to defend their nation’s territory against invasion, or to save lives. 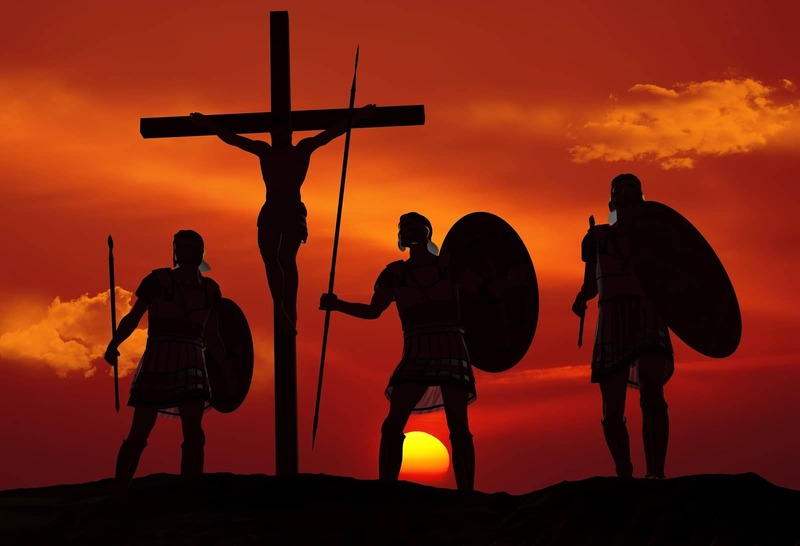 At the final judgment before God, every soldier must account for what they’ve done. Like many combat veterans, I did things that I’m now ashamed of. But, full forgiveness is available now through repentance and the blood of Jesus. I’m not ‘a shrink,’ but from experience and observation I believe PTSD is caused by a combination of (1) guilt and (2) fear. There’s no reason to be tormented by guilt. Repent of your sins and receive forgiveness by the blood of Jesus. After you receive God’s forgiveness, and start walking in His Spirit, there’s nothing to fear. If you’re injured or die while walking in God’s will, you’ll be rewarded by God; so there’s nothing left to fear, from God or man. Will you give your life as a disciple of the Messiah, Jesus? Jesus doesn’t just call us to risk our lives; Christian disciples are called to give themselves as living sacrifices, as the Lord Jesus did for us. Soldiers, policemen, and firemen risk their lives to help others, but they hope to survive through each dangerous situation. I think of it this way…I believe I died in 1972 in that loach crash, but then God brought me back to this world. My life since then is a gift, and I owe it to the Lord Jesus Christ—who loves us and gave Himself for us. He is the perfect human model to emulate in my life, and (I hope) yours. He gave His life, His soul, and His blood for me; He is the only one worthy to give my life to. Great article and hits home to this Iraq veteran. Some things never change I guess. Young men want very badly to believe the things they are told about patriotism. Young men grow up quickly in the military and realize that some of the things they believed weren’t true at all. I am thankful that my time in the military led me to find Jesus as well. Thank you for this veterans story of your time in Vietnam. This was an extremely difficult and sad war for all the nations involved but especially for the USA as your losses were just too severe. Please do not feel any guilt…..its not yours. God found you which is wonderful. There is no need to respond to my comments. I stumbled across your message when I was researching helicopter images and as with all stories of the war – found it very poignant and sad. I say the Rosary now and again – for all those NZ and OZ headstones around the world in all of the military dedicated sites. With your story in mind I will include USA heli crews now too. Blessings to you Dr Tom. Thanks Veronica. God bless you. Britt, did you get my e-mail?